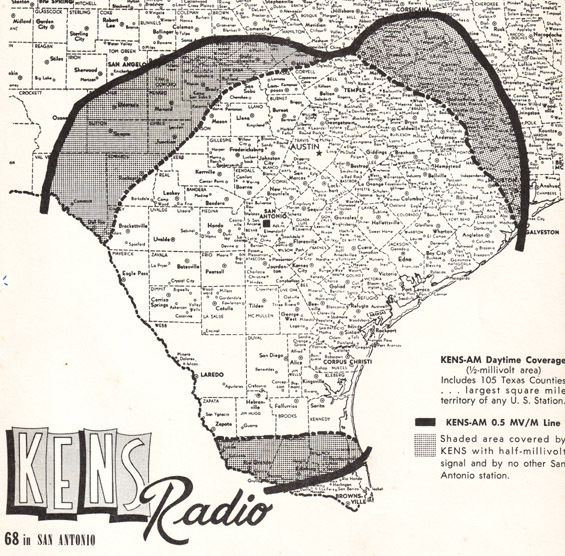 KENS 680 Radio, in San Antonio, was an old line CBS Radio Network affiliate through most of the 1950's. KENS aired the Arthur Godfrey variety show in the mornings. That was followed by a 3 hour block of radio soap operas in the afternoons and even more network programming at night. Then…Radio as an industry began floundering when Television struck it a hard body blow. KENS was no exception. It was owned at that time by the publisher of the San Antonio Express and News newspapers, who also owned KENS-TV. The "ENS" in KENS stood for "Express News Stations". The Huntress family owned the newspaper, television station and KENS Radio. Both the newspaper and television station were doing extremely well and suddenly, the radio station was not. KONO was the top station in the market at that time. So Frank Huntress, President of the stations and the newspaper, hired C. Herb Skoog (KONO Program Director) away from KONO to become KENS Radio's General Manager. Herb, in addition to his programming duties, had done an air shift at KONO, using the name Herb Carl. Herb greatly improved the KENS sound. He changed the music, hired very good air personalities, added fun contests...and promoted it with a heavy advertising campaign in the Express and News newspapers. The station sounded great, until it collided with the 3 hour soap opera block and/or another of the CBS Network programs. Herb found himself up against an impossible situation. The only real answer was to completely eliminate the CBS Network radio programming. The newspaper's top management just couldn't understand why Radio couldn't continue to survive and prosper with the block programming. After all, it worked very well not only for the TV station, but also the newspapers. The biggest stumbling block to getting rid of the block programming was that management was afraid that if they dropped the CBS Radio Network, the very lucrative and highly rated CBS Television Network could be jeopardized for TV. Herb had a really tough sales job to do. But...Somehow he got it done. After much study and many discussions, the decision was made to change KENS Radio to a country format. Herb hired Charlie Walker, Bill Mack, Neil Merritt and Ray Baker as air personalities. If you know anything about radio personalities, this is, without a doubt, one of the best line ups of country DJs ever assembled. The station was an immediate success. KENS was the first 50,000 watt powerhouse in Texas to go full time Country Music. Mail and phone calls came in from all over the southern part of Texas. KENS had very good ratings (Hooper was the only ratings providor at that time) not only in San Antonio, but also in Waco, Austin and Corpus Christi. Sales shot up. I know sales were good because I was KENS Sales Manager. Everything was peaches and cream from 1958 until 1961. Judge Roy Hofheinz, former Mayor of Houston and prime mover in the building of the Astrodome, bought a major league baseball team for Houston. He named the team the Colt 45's. A few years later, he changed the name of the team to the Astros, when the Colt Firearms Company objected to the use of their service marked name. Judge Hofheinz started a radio network to broadcast Astros games and promote the team. No station in San Antonio wanted any part of the network...Including KENS. Hofheinz solved that problem...He bought KENS. The price was $750,000, which was a huge sum for a radio station in the 1950s. Now the Judge may have been seen as a “Good Ole' Boy,” but he did NOT like country music. I personally heard him say that no station that he owned would ever play "That 'Stuff.'" He not only put the play-by-play broadcasts of Astros on KENS, but he also changed the station's call letters to KBAT. The "BAT" part of the call letters was there to promote the baseball broadcasts. The music format was changed to what was then called "Middle of the Road (MOR)." One would probably call it “Standards” in today's terminology. My good fortune led me to KILT in Houston. Herb bought KGNB in New Braunfels, where he remained for the rest of his broadcast career. Editors Note: Supposedly KENS had a live broadcast studio located in the middle of North Star Mall. Later KMFM not only had their studios at North Star Mall, but also their transmitting tower and antenna as well. Also there was a broadcast studio (see Boots website entry) at the top of one of the gigantic North Star Mall Boots. Copyright 2014 by Chet Maxwell & SanAntonioRadioMemories.com – All Rights Reserved.